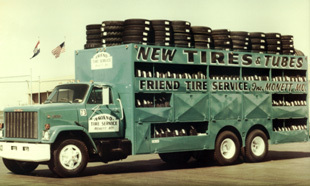 Friend Tire Company was established in Monett, MO in 1956 as a small tire retreading business, later moving to new tire sales only. Up until 1984, our salespeople were our delivery drivers. Each salesperson ran a weekly route with a select inventory to sell loaded on their truck. In our early years, there weren’t that many different tire sizes in the market. But as tire sizes began to expand, we had to make a change. Later that year, we hired dedicated delivery drives. Our sales people began taking orders over the phone, but continued to make routine sales calls. Routes became established based on the tires ordered. Today, our sales people still take orders over the phone, and continue to make regular visits to customer locations, but customers can also place orders online. Friend Tire Company is now a wholly owned subsidiary of Yokohama Rubber Corporation. We carry a large selection of passenger tires, light truck tires, medium truck tires, trailer tires and wheels, tubes, and even specialty tires such as lawn and garden, ATV, and tractor tires. 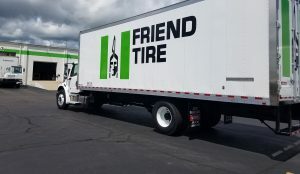 Friend Tire Company sells exclusively to independent tire dealers. Our main priority at Friend Tire Company is to have the best customer service in the business. We specialize in fast and frequent deliveries, offering delivery service multiple times daily in many areas. President Don Isbell has been with the company since 1961. Most of our home office staff in Monett, MO has been with the company for over 20 years. Our knowledgeable and experienced staff is here to help when needed. When you talk to someone at Friend Tire Company, you’re talking to a professional that understands and cares about your business.